They have been with us for centuries – the roll-with-a-hole called a bagel. But when The Bagel Store in Brooklyn turned them into a psychedelic rainbow of twisted dough, our love affair with the bagel only got deeper and more colorful. I haven’t had this much fun in the kitchen in a long time! Hope you have as much fun as I did! Pour the yeast and sugar into a large bowl. Add warm water, but do not stir. Let it sit for 5 minutes, and then stir the mixture to dissolve. Add flour and salt and stir with a large spoon until you can gather the dough to place on a floured surface. Knead the dough for about 6-8 minutes until it is smooth and elastic. If it is too moist, add a sprinkling of flour until the dough is not sticky. Lightly coat a large bowl with butter or oil, and place the dough in a bowl. Cover the bowl with a damp dish towel. Let it rise in a warm place for 1 hour, until the dough has doubled in size. Punch the dough down, and let it rest for another 10 minutes. Carefully divide the dough into 8 pieces (should be roughly 3.2 oz balls). Shape each piece into a round. Wearing disposable gloves, take each dough ball and color with food coloring, working the dough to distribute color. With a rolling pin, roll out each dough ball to form a rectangle. Make sure each dough ball is rolled out the same size. Layer each rectangle on top of each other. Cut into 1" strips, lengthwise. 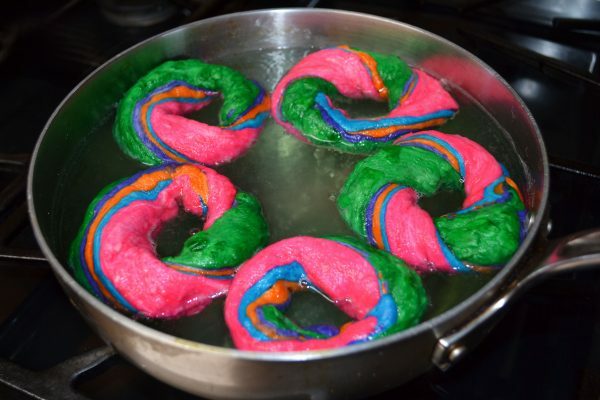 Twist the dough into a round bagel shape and seal the ends by rolling with your hands or pinching (you can use a little bit of water on your fingers to act as glue). After shaping the dough rounds place on a lightly greased cookie sheet, cover it with a damp kitchen towel and allow to rest for 10 minutes. Prepare a pot of boiling water. Drop 2-3 bagels at a time into the water and cook for 2 minutes. Flip the bagels over after 1 minute. With a slotted spoon, remove the bagels and place them on a baking sheet lined with parchment paper. Repeat until all bagels are boiled. Sprinkle tops with desired seasonings (I used a garlic sea salt mixture). Preheat the oven to 425ºF. Bake the bagels for about 20 minutes, or until cooked thoroughly. Serve while still warm with cream cheese or butter. Mix enough powdered sugar into 8 oz of cream cheese to reach desired sweetness, starting with 1 tbsp and adding more for a sweeter spread. Add about 1 tbsp of rainbow sprinkles and mix.